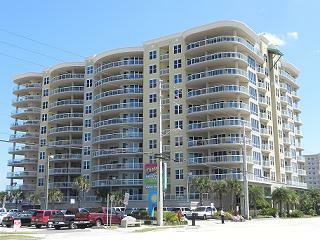 Ocean Villas Condominium has set the standard for luxury coastal living in Daytona Beach Shores. The 11 floor, 76 unit complex provides the best of the best and has everything you could want and more. A 3 elevator system provides privacy that you and one other unit share. Glass railings on the oversized balconies provide unobstructed views of the ocean and river. Our team's choice for one of the top 3 condos in the area. Each unit has a built in summer kitchen for outdoor cooking and entertaining! Location, location, location! Within walking distance to breakfast, lunch and dinner.